Australian researchers have found that green tree frogs (Litoria spp.) use condensation in the same way as windows on frosty mornings. During the dry season from June to September, Ozzy water is a precious commodity. These enterprising Amphibia expose themselves in such a way as to gather the air's excess moisture when temperatures plummet. "Every once in a while, we would find frogs sitting on a stick under the open sky, on nights when it was so cold they could barely move, and when the ground was so dry we'd kick up dust as we walked," said Dr. Chris Tracy, one of the three scientists from Charles Darwin University. "It was a real puzzle!" As quite large frogs(10 cm long), they lost 0.07 g of water on a cold night but gained 0.4g, or 1% of the average body weight. They returned in the experiment to their own eucalyptus den or a PVC pipe to recoup the condensation, with 60% of each drop of condensation absorbed. The only analogous situation could be the use of spines by desert plants to absorb due from a maritime habitat. Dr. Tracy points out that the frog's survival possibly depends on this water habit in the Australian savannah. The docile frog is a very popular pet with enthusiasts, but it's unlikely owners would come across this behaviour in their comfortable cage. The wild frog varies in its choice of domicile: a canopy of eucalyptus trees near a billabong source is your typical Australian frog habitat. However, they can survive in swamps or in grasslands. Green Tree Frogs are well known for inhabiting water sources inside houses, such as showers or toilets. They can also be found on windows eating insects and occupy tanks and guttering, as these have a high humidity and are usually cooler than the external environment. The photographs (above and below) show Litoria sitting firstly among their favoured Eucalypts, pondering perhaps on whatever Northern Territory Australians ponder. 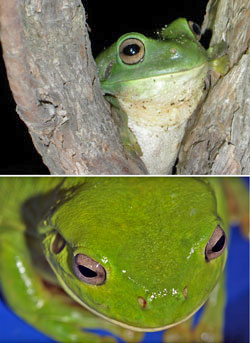 The photographs shows water droplets on the head after a cool frog spent twenty minutes in a warm, humid hollow (bottom). The animal has to be in a cold area and then return to a warmer environment. Hence the strange behaviour. The interest in the research could now rely on how many other animals could risk hypothermia by gaining water in such situations. For obvious reasons, deserts are little studied, especially in the hot season. Certainly there remain many discoveries to be made on water retention and absorption in smaller species that are rarely studied or just plain rare!